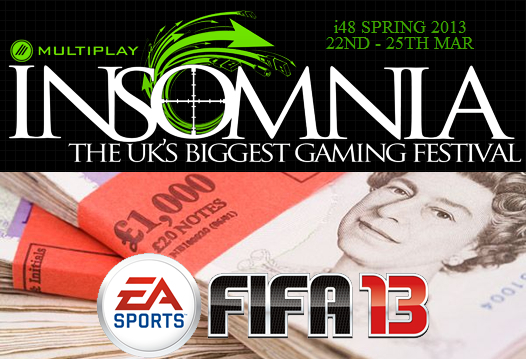 insomnia48 (i48) runs from 22nd March to 25th March 2013 at the Telford International Centre with our partners at Multiplay UK and your Sweetpatch TV team will be there running all the FIFA 13 activity for you. In the build up we want to keep you completely updated on everything that will be happening in the run up and at insomnia48 (i48). So what FIFA 13 is on before and at insomnia48? During March we will be running a FIFA 13 1v1 online tournament with the winner claiming their entry ticket in to i48. From now until i48 we will be working on partnership with MadCatz to run weekly competitions where you can win some great MadCatcz controllers and headsets. It does not get any BIGGER than this if you play competitive FIFA in the UK! During the build up to insomnia48 we will be exploding the news behind the FIFA Masters Series and how it will benefit all competitive FIFA gamers in the UK. The FMS will kick off at insomnia48 and your attendance there will ensure you are involved from the start. 1v1 Pro Tournament Groups Starts at 12pm on the Saturday and runs to 6pm. 64 Player Cap. 1v1 Pro Tournament Resumes at 10am on the Sunday and ends at 4pm. After the huge success of the FIFA13 1on1 tournament at previous events, Multiplay UK have made the decision to give £1,000 with, triggers increasing it from that point. That’s 5x the amount they guaranteed previously! With this comes potentially a massive £2,000 prize pool with 64 players! 1v1 Casual Tournament Starts at 1pm on the Friday and runs until complete. 32 Player Cap. Lots more news coming regularly between now and i48. So, what is the Insomnia Gaming Festival, or iSeries as it’s known? Well, fundamentally Insomnia is a gaming event for all ages, where gamers and industry leaders alike come together to celebrate games in all their forms. To find out about the venue, head over to the Venue Information Page! For many gamers in the UK, and indeed Europe and beyond, the Insomnia LAN is now a British institution and staple part of the gaming calendar, with the event playing host to some of the biggest eSports tournaments in Europe, and annual host of the UK qualifiers for the World Cyber Games. The event, held 3 times a year at The International Centre in Telford, accommodates over 3000 gamers for 5 days; it’s certainly grown from it’s humble beginnings of no more than 50 all playing off one 10mb switch!